"What you laughin' at, sucka?" Penitentiary tells the story of "Too Sweet" (Leon Isaac Kennedy) a young African-American man unjustly convicted after defending a CB-radio prostitute when she's attacked by two redneck customers. 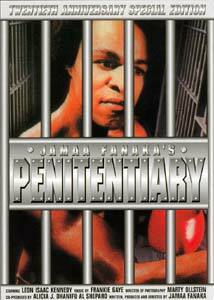 He's sent to a bizarre prison where violent, authority-sanctioned boxing determines social status and privileges. Training and talent give him a shot at parole and a woman if he can win the annual boxing tournament and impress the warden's promoter brother. Released in 1980, Penitentiary lies somewhere between the "blaxploitation" explosion of the 70's and the work of second-generation African-American filmmakers like Spike Lee and John Singleton. Writer/director Jamaa Fanaka pulls out every profane prison-dialogue cliche in the book, and populates his prison with stereotypes—two flamboyantly gay prisoners, an old-timer offering sage advice ("Keep your a-- clean"), a fat, cigar-chomping Caucasian warden, and a rogues' gallery of insane, violent toughs. Penitentiary was obviously shot on a low budget, though the lighting is quite good. It avoids many of the cliches of its 70's predecessors, with corrupt but not necessarily racist white characters, and it chooses to indict the System rather than "The Man." But none of the characters are very well-developed, making it difficult to care who wins or loses, and there's a lot of "dead air" in the film which isn't helped by a few "serious" dialogue scenes. It's also hard to buy the film's environment—security is SO loose (a mere handful of wimpy-looking guards) that inmates are allowed to carry lethal blades, kill each other with near-impunity, and copulate with visitors from the nearby female prison in the restrooms. Much of the acting is stilted and unnatural, with characters politely waiting for their turn to speak, and many scenes ring oddly false, as if taken from rehearsals where neither the cast nor the director really knew what to do with the material. Technical glitches abound—prison bars get in the way of many shots, and some reaction shots are re-used to cover obvious post-production voice-overs. Ultimately, it's hard to get a handle on Penitentiary as a story or as a morality tale. I doubt this was Fanaka's intent, but the film's overriding philosophy seems to be that violence is a useful tool for advancement. "Too Sweet" has a heart-to-heart talk with one put-upon prisoner (Thommy Pollard) in which he sensitively points out that five fingers can be used to make a fist; while we know little of his pre-prison life, his pugilistic exploits allow him to leave the prison with a promising future. Penitentiary now seems dated and frustratingly pointless—its over-the-top violence helped it become one of the biggest-grossing independent films of the 80's and spawn two sequels, but it's hard to see why twenty years later, when more substantial releases like Fight Club have become relatively mainstream. Image Transfer Review: Xenon presents Penitentiary in its original 1.85:1 aspect ratio with a non-anamorphic transfer. The packaging claims a "remastered" transfer, but the source print is in middling condition, with visible damage, heavy grain in a few shots, and significant scratching including a vertical line running through much of the second reel. Color is solid and there are few distracting digital artifacts, but the image is on the soft side and dark areas are washed out in some scenes. While this is no doubt the best edition of Penitentiary available for home viewing, the condition of the source print leaves much to be desired. Audio Transfer Review: Penitentiary is presented with its original monophonic soundtrack, in Dolby Digital 2.0 decoded to play through the center speaker. The audio is technically crude, with varying volume levels, obvious ADR dialogue "looping," and one extremely clipped line that must have hit the "red zone" during recording. Most of the dialogue was recorded "live" and carries significant hiss, and the sound editing is poor, with little overlap between shots, apparently cut WITH the physical footage. Xenon's DVD transfer seems solid enough, but this is a poor soundtrack by any standard. The film's lengthy 4-minute trailer is presented in its original 1.85:1 ratio—the print is "flecky," worn in spots and quite soft, though it's actually more coherent than the feature it promotes. Director Fanaka delivers a stream-of-consciousness commentary, jumping from subject to subject as images in the film trigger memories of the production and personnel involved. He provides some insight into the film's intended morality, unfortunately obscured in the finished film, and seems to enjoy watching the movie, though sometimes he predicts and reacts to the action like an annoyingly vocal theater-goer. The pacing is slow with a fair amount of silence and some repetition, but it's an informative commentary overall. The trailer to the more outrageous sequel (second in the Penitentiary trilogy) is presented in a 1.85:1 ratio with monophonic audio. The source print has significant flecking and grain, but it's a fairly dynamic trailer, reasonably well transferred. Penitentiary is a unique exploitation film that has its entertaining moments, if not always for the right reasons. Xenon's Twentieth Anniversary Edition DVD features a competent transfer (considering the poor quality of the source) and worthwhile supplements. Fans of the film will want to own this release, imperfect though it may be; others should rent first.